Trainer Peter Miller has taken shots on Dubai World Cup night the last two years, and he suggested Monday that "the third time is the charm." If so -- and if Roy H is the winner of the Dubai Golden Shaheen (G1) -- it's plenty possible there's a new No. 1 come next week in the NTRA Top Thoroughbred Poll. 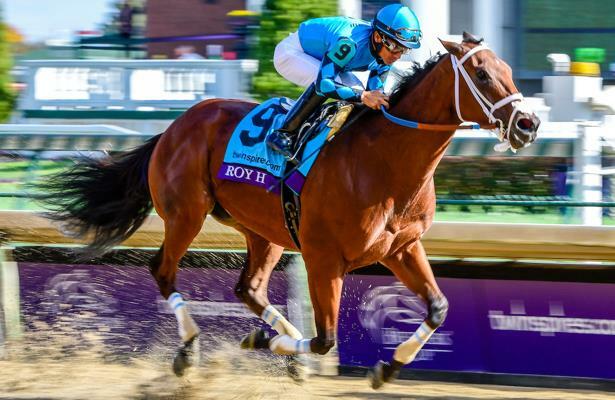 The two-time champion sprinter climbed two spots in this week's rankings released Monday, only 12 points behind Monomoy Girl, another Eclipse Award winner, but one who hasn't run yet in 2019. Roy H kicked off his season with a successful defense of the Palos Verdes (G2) at Santa Anita Park and has already shipped for Saturday's Golden Shaheen, in which he was third a season ago. Competition at Meydan includes two horses Roy H defeated two starts back in the Breeders' Cup Sprint, Imperial Hint and Promises Fulfilled, as well as Rockingham Ranch stablemate X Y Jet. Others in the NTRA Top Thoroughbred Poll's first five were Bricks and Mortar, a narrow winner of last Saturday's Muniz Memorial Handicap (G2) at Fair Grounds; the retired Pegasus World Cup (G1) winner City of Light; and McKinzie, the likely favorite in the April 6 Santa Anita Handicap (G1). The NTRA Top Thoroughbred Polls is the sport’s most comprehensive survey of experts. Every week eligible journalists and broadcasters cast votes for their top 10 horses, with points awarded on a 10-9-8-7-6-5-4-3-2-1 basis. All horses that have raced in the U.S., are in training in the U.S., or are known to be pointing to a major event in the U.S. are eligible for the NTRA Top Thoroughbred Poll. The NTRA Top Thoroughbred Poll concludes November 4 after the running of the Breeders’ Cup. Click here for a glance at individual ballots. Other horses receiving votes: WORLD OF TROUBLE (39), BATTLE OF MIDWAY (38), WHITMORE (28), CATHOLIC BOY (27), CORE BELIEFS (19), VASILIKA (17), BRAVAZO (15), STORMY LIBERAL (14), ZULU ALPHA (11), GAME WINNER (9), DO SHARE (9), ELATE (9), SILVER DUST (8), THUNDER SNOW (8), VINO ROSSO (8), NEWSPAPEROFRECORD (8), IMPROBABLE (7), UNIQUE BELLA (6), PRINCE LUCKY (6), BELLAFINA (6), OMAHA BEACH (5), RECRUITING READY (5), MITOLE (4), GUNNEVERA (4), CODE OF HONOR (4), PRECIEUSE (4), KELLYBEGS CAPTAIN (3), CHASING YESTERDAY (2), AUDIBLE (2), RUSHING FALL (1), IMPERIAL HINT (1), YOSHIDA (1), UNCONTESTED (1), MARKITOFF (1), DIVERSIFY (1), DELTA PRINCE (1), COAL FRONT (1).